Hipsters. 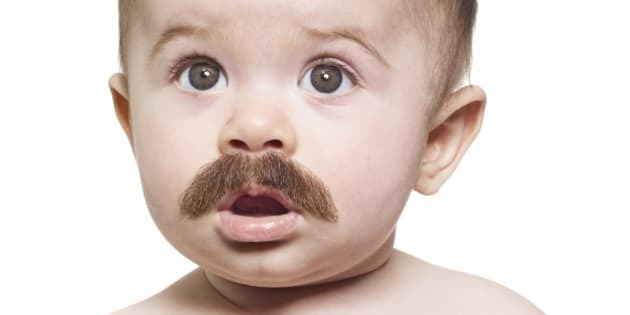 First they were growing facial hair, then they were drinking craft beer (and then, in a swift about-face, non-craft beer), and now the inevitable has happened -- hipster offspring. Though it's a while before these trendy tots will be able to rock a top-bun or sport a tattoo, rest assured, their hipster-ness can be conveniently established from birth thanks to an increasing (but never mainstream) collection of 'hipster baby names', some of which are outlined in Tobias Anthony's new book Hipster Baby Names: 322 Really, Really Ridiculously Good Names For Your Kid. Yes, just like the cleaning product! Apparently the roots of this name extends to Greek mythology, but let's be real, most of us immediately think of Spray and Wipe. Honourable mentions: Ace, Arlo, Axl. Because nothing says 'hip' like naming your child after a nonconformist UK stencil artist. Especially one whose art is available in thousands of knock-off prints, t-shirts and even baby onesies, amirite? Honourable mentions: Bento, Burlap, Beat. This was a tough one to pick, because Chia (yes, as in the seed) is obviously a strong contender. However the fact 'Cub' will prove markedly more difficult to transition into adulthood made it the stand out. Wonder if one day this kid will refer to his home as a Cubby House? Honourable mentions: Chia, Copernicus, Clive. Make sure you tell everyone THE D IS SILENT. Perfect for Tarantino-loving parents who want their child to grow up 'unchained', as it were. Honourable mentions: Dali, Dixie, Deck, Dutch. Which is definitely different to North. And West. Honourable mentions: Enoch, Ethel, Eyelet. Ooh, again a tough one. How does one choose between Folk, Fleetwood and Fixie? Here's praying for triplets. Honourable mentions: Fleetwood, Fixie, Fox. Let's face it, Griffin has been and gone. In fact, even the use of the letter 'i' is so 2015. This year, Gryff is where it's at. Honourable mentions: Gulliver, Godric, Gyoza (seriously). Arguably the perfect name for the Australian hipster baby, not only does Hopper loosely refer to how kangaroos get around, it also rhymes with 'Chopper' and gives a subtle nod to hops, an essential ingredient in any fine beer. Honourable mentions: Huck, Hoxton, Holden. Make sure to buy your baby a pair of over-sized (prescription-free) specs. Just think of the #hashtag potential. Honourable mentions: Ike, Ithica, Indie. WARNING: According to babynames.com, Jagger is the currently placed at number 705 of names in U.S. births. This means there could be a very real risk of another baby sharing the same name as yours. However, extra points can be awarded for pronouncing it 'Yah-ger'. Honourable mentions: Jericho, Jezebel, Juno, Juniper. Much like Kai, Ked is short, punchy and starts with a K. Also a popular brand of canvas shoes. Need we say more? Honourable mentions: Kale, Kai, Kombucha. To be revived as a girl's name only, Logan is actually from Scottish origin and means 'little hollow'. Perfection. Honourable mentions: Leopold, Loki, Lennox. Sweet like the syrup, natural as the tree. Or the leaf. Bonus: can use Canadian flag as personal cape. Honourable mentions: Magnus, Magnolia, Major, Milo. Once classified as a nerd's name, it's time to revel in Neville, don't you think? So ironic. So hip. Honourable mentions: Nico, Nola, North. Are you sure this is a Prius? Much like Maple, Oak is about NATURE. And Nature is Good. Oak is also used to make wine barrels so, that's a plus. Honourable mentions: Orson, Orpheus, Otis. So retro. Much theory. Very triangle. Honourable mentions: Prius, Prairie, Potter. The perfect accompaniment to any vegan cheese board. Honourable mentions: There are none. Quince is queen. Because it's not as obvious as Rain or as boring as Rainy, but still embraces the refreshing moodiness of moisture, y'know? Because water is the essence of wetness. And wetness is the essence of rain(a). Honourable mentions: Raven, Roscoe, Rufus. This little dude is no doubt destined to be a lover of libraries, second-hand books and dust (if he's not allergic). A good one to pick if you want the world to know his parents are extremely well-read. Honourable mentions: Scout, Seven, Soy, Spike. Like Cub, this seems a little short-sighted in terms of remaining appropriate with age. But planning is for the unadventurous. In the meantime, you can hike with Tyke on your fixie bike -- what's not to like? This was the only 'U' name in Anthony's book so we didn't really have choice here, but props to The Little Mermaid nostalgia factor. One of the better Instagram filters. Now also a name for your adorable baby girl. Honourable mentions: Van, Vera, Velma. What's this? A brand of bourbon AND an iconic hippie music festival in '69? Stop it. Honourable mentions: Wren, Winona, Wisky, Wolfgang. Any ideas on how to pronounce this one? Us, either. It's not Zara. It's not Tara. Or Lara. YARA. Honourable mentions: We got nothin'. Because what is the experience of bringing a newborn child into this world if it's not zen? We don't know. We just don't know. Honourable mentions: Zeitgeist, Ziggy, Zowie, Zooey. Hipster Baby Names: Really, really, ridiculously good names for your kid is available at selected retailers for AU$ 22.99.